Editor Shawn Waggoner provides an overview of Judson Studios’ monumental creation, Resurrection Window, the first time a notable liturgical window was created entirely from fused glass. 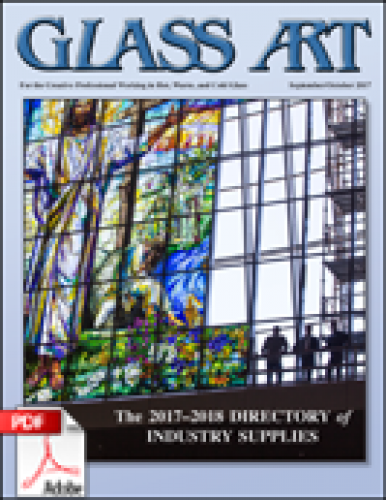 She also reminds readers of Glass Art’s annual Directory of Industry Supplies, which helps glass enthusiasts locate glass companies, products, and supplies. For Resurrection Window, the world’s largest single composition fused glass window, Judson Studios collaborated with world-renowned artist Narcissus Quagliata to bring this vision of Judson designer Tim Carey to life. The project is the first time a notable liturgical window was created entirely from fused glass. To celebrate the 15th anniversary of the Adler Aphasia Center in Maywood, New Jersey, Society of American Mosaic Artists (SAMA) artist Bonnie Cohen designed a mosaic mural to honor the organization’s generous donors and founders. Everyone who participated saw how art can bring people together to heal, energize, and bring joy to life. A room full of some of the real gurus of glass plus approximately 100 other glass artists and enthusiasts helped to inaugurate a weekend filled with demonstrations and hands-on activities. GlassQuest 2017 allowed participants to see how willing the presenters were to share their knowledge and expertise with humility and a generous spirit. The American Glass Guild (AGG) met in Rochester, New York, in mid-May 2017 for the Harmony: Old and New, On Light and the Gift, Nurturing the Creative Mind conference. This event covered hands-on opportunities, an impressive variety of lectures, a tour of area stained glass and art glass, and numerous chances for networking. The Contemporary Glass Society (CGS) will be celebrating 20 years of supporting the glass arts with Connections, a conference looking to both the future and the achievements of the past. 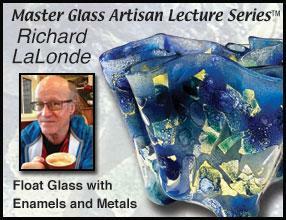 Internationally and nationally renowned speakers will reflect on connections with glass-making and other artistic media. Glass Art’s annual Directory of Industry Supplies is dedicated to making the buying and selling process between artists, retailers, and suppliers mutually beneficial. Alphabetical listings of companies as well as for products and services provide glass artists with new sources for the materials they need in their creative pursuits. From spots and stripes, teeth and claws, to his trademark eyes, Salt’s detailed borosilicate sculpture has an undeniable hold on the functional glass community. As he works, the artist lets his imagination run wild in the creation of his unique creature sculptures. Bob Leatherbarrow discusses ways to experiment to find a unique color palette for kiln formed glass projects including testing for chemical reactions. The methods described are particularly useful for artists who use powders for painting with light, textural work, powder printing, and the ever-increasing number of other techniques involving glass powders. Like a photographer, April Surgent’s landscapes and portraits in glass pack the same powerful punch, but with the added elements of dimension, texture, and translucent light. Her fused and cameo engraved glasswork put a modern spin on the ancient techniques used to create them.